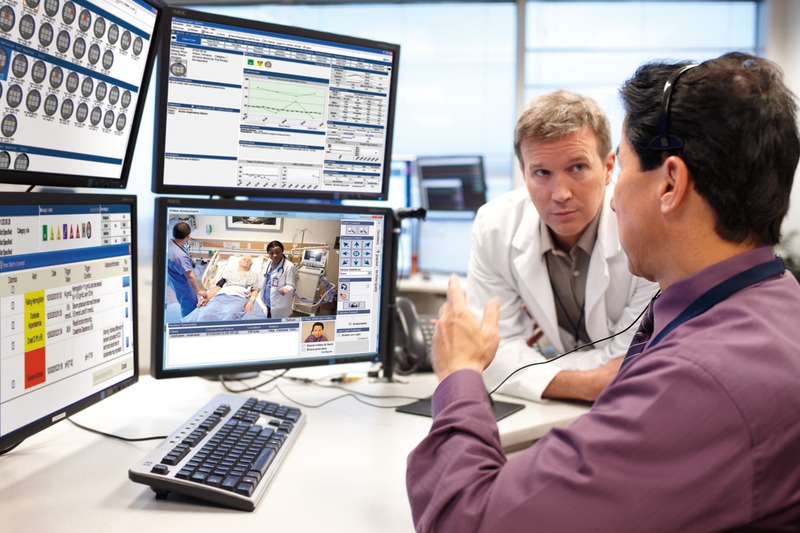 Amsterdam, the Netherlands – (NYSE: PHG; AEX: PHIA) today announced four leading U.S. health systems have signed multi-year telehealth agreements with Philips to implement its remote intensive care unit (eICU) program. These new population health management engagements include agreements with Westchester Medical Center Health Network in New York, Baptist Memorial Health Care in Tennessee and BJC HealthCare in Missouri and will further extend Philips’ eICU reach by hundreds of beds and thousands of ICU cases each year. Over the past 15 years, the program has been implemented in more than 50 health systems and 500 hospitals in the U.S. to deliver care throughout 3.5 million ICU patient stays . The conditions of ICU patients can deteriorate rapidly. The eICU program’s telehealth team of remote specialists continuously monitor patients to support the bedside team and proactively identify issues and intervene before they become significant problems. The eICU telehealth team has access to Philips advanced analytics that can process large amounts of data from more than 150 patients, along with data visualization tools that allow clinicians to focus on those patients who need their attention first. Ultimately, this type of proactive care can help improve clinical and financial outcomes. Compared to patients receiving usual ICU care, patients who received ICU care from a hospital with an eICU program were 26% more likely to survive and discharged from the ICU 20% faster . Additionally, on average, tele-ICUs result in USD 5,000 in cost savings per patient , and USD 1.2 million in savings due to reduced transfers . As the population in the U.S. ages, demand for critical care is rising at a time when the industry is facing a chronic shortage of intensivists. According to The Journal of the American Medical Association, the intensivist shortage will become increasingly challenging, with supply meeting only 22 percent of the demand for services by 2020 . Consequently, ICU patients are often cared for by non-specialists. Telehealth enables intensivists to cover wider geographies and provide access to care to more people, while patients stay in their local hospitals. This helps them avoid both transportation costs and the stress of transferring to other critical care centers, while still giving them access to the specialized care they need. The Philips eICU program is part of a suite of enterprise telehealth solutions delivered by Philips Hospital to Home to help improve outcomes, provide better value and expand access to care. Programs help address multiple cohorts within a population ranging from highest cost patients with intensive ambulatory care and acute needs, to discharge transition and chronic patient management, to prevention and wellness for the general population. These programs use a proactive care model to clinically transform the delivery of care to address growing clinician shortages while improving patient outcomes. Philips will be showcasing its integrated telehealth solutions and services at booth #3416 at the HIMSS 2016 Annual Meeting and Exhibition, taking place Feb. 29 – Mar. 4, at the Sands Expo in Las Vegas, Nev. For updates on Philips’ presence at HIMSS, follow @PhilipsLiveFrom and visit www.philips.com/HIMSS. Data are rounded figures based on a query of the eICU Research Institute database conducted in December 2015. Lilly CM, et al. A Multi-center Study of ICU Telemedicine Reengineering of Adult Critical Care. CHEST. 2014 Mar 1; 145(3): 500-7. TeleICUproject with University of Massachusetts Memorial Medical Center. November 17, 2008. Zawada, et al. Impact of an Intensive Care Unit Telemedicine Program on a Rural Health Care System. Postgrad Med J, 2009; 121(3):160-70. Angus DC, et al. Current and Projected Workforce Requirements for Care of the Critically Ill and Patients With Pulmonary Disease. JAMA. 2000 Dec 6; 284(21): 2762-70.